The UK is looking toward a "new partnership" with Europe after Brexit, the Queen has said. 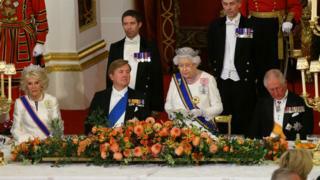 Speaking at a state banquet for the King of the Netherlands, the Queen said the "enduring alliance" between the two countries remained strong. "As innovators, traders and internationalists we look with confidence to the future," she added. Earlier, King Willem-Alexander said it "saddens us" to see the UK leave the EU but "Brexit does not mean farewell". The king reiterated the comments in a speech at the banquet, but stressed he respected the decision of the 2016 referendum. He also went on to praise the Queen, describing her as "most fearless Bond Girl ever" as he referred to the film shown at the London 2012 Olympics opening ceremony in which the monarch featured alongside 007 actor Daniel Craig. The king and his wife Queen Maxima are taking part in a state visit to the UK. As UK politics continues to be dominated and divided by Brexit, the Queen touched on Britain's departure from the EU next March in her speech at Buckingham Palace. She referred to the state visit of the king's grandmother, Queen Juliana, in 1972. Recalling her speech on that occasion, the Queen said she had mentioned the two nations' relationship would become "increasingly important as a new configuration of Europe was emerging". She then added: "As we look toward a new partnership with Europe, it is our shared values and commitment to each other, that are our greatest asset." Prime Minister Theresa May, the Prince of Wales and the Duchess of Cornwall, and the Duke of Cambridge were at the banquet, along with senior members of the Cabinet and leading figures from British and Dutch life. Labour leader Jeremy Corbyn met the Dutch king earlier in the day and was represented by shadow foreign secretary Emily Thornberry. Earlier, the Dutch royals were escorted by the Prince of Wales and the Duchess of Cornwall from the Dutch embassy to Whitehall. Speaking in the Palace of Westminster's Royal Gallery, to an audience including Mrs May, Foreign Secretary Jeremy Hunt and Home Secretary Sajid Javid, King Willem-Alexander said 100,000 Dutch citizens in Britain and the 50,000 Britons living in the Netherlands were valued as "employees, colleagues, neighbours or volunteers". "They feel at home in their local community and their contribution to society is valued, whether as employees, colleagues, neighbours or volunteers," he said. "Every day they prove how good the match is between the British and the Dutch. "Yet all these individuals now live under the shadow of uncertainty about their future status. "I understand how difficult this is for them and I trust this uncertainty will be resolved." The UK government has promised to guarantee the rights of EU nationals after Brexit, even in the absence of a deal with the EU.